Police say this man is a person of interest in the feces attack. A woman riding the Chicago Transit Authority's Blue Line in Oak Park told police she was last week attacked by another passenger wielding a sock filled with human feces. "The guy got on with me at [the] Oak Park [station]," she said. "I wasn’t really paying attention. ... "Next stop [at Austin], he throws something in my face." Oak Park Police Commander Ladon Reynolds said officers responded by searching for the man in and around a gas station at Harrison Street, but did not find him. Reynolds said police retrieved a photo of a "person of interest" matching the description the woman and other witnesses gave. That man was videotaped on the Austin platform. 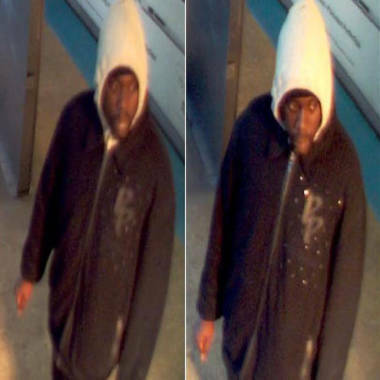 "We have photos of the offender and we’re seeking to identify him," Reynolds said of images obtained from the CTA. "We’ve reached out to other [police] agencies and have issued a bulletin." CTA spokesman Catherine Hosinski said the transit agency has “several high-definition video cameras” at each station. "They really aren’t prepared for a situation like that,” she said. "I don’t know why he did it," she said, adding, "I’m pretty sure he wouldn’t have done that to a guy."